We support, promote and encourage participation in team sports within the local community. Pine Rivers United Sports Club Inc is located at Wendy Allison Park on Samsonvale Road, Strathpine. We are a fully licensed club with gaming machines catering for men’s, women’s and junior football as well as social darts. Sporting facilities include two floodlit football fields on which men,women and children play day and night games, as well as other well lit training fields which are used for our Junior player games. There are also two floodlit netball courts which were resurfaced in 2016. So whether your sport is football, social darts or you just want a relaxing place to meet up with friends, Pine Rivers United Sports Club Inc is the place for you! The Club was formed as a soccer club in 1967 by a local man Jack Gurteen, from a group of Pine Rivers High School students who used to kick a ball around in their lunch time. The lads approached Jack and a game was arranged with Redcliffe City U14’s at Redcliffe. The Pine Rivers team won 5-3! As a result, parents of the winning team decided to get together and start a club. At the same time a number of youngsters from Lawnton State School came along and asked for a game. They were 9-12 year olds. Jack arranged a game against Zillmere, but Rivers lost 16-0. The Club later became incorporated as a multi-sports club. The current clubhouse was built in 1978. 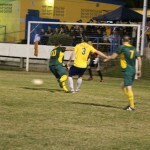 Pine Rivers United caters for men’s football, women’s football, junior football and social darts. We are well known around the area and as such attract talented players and their families from outlying areas such as Redcliffe, Caboolture and Bribie Island and nearby districts such as Sandgate, Albany Creek, Petrie and Kallangur. We have a committed committee to ensure football has a strong voice within the club. We are always looking to attract new players of all abilities whether to develop skills or simply get fit and enjoy a friendly team spirit.